Warning:Refer toHot Exhaust System Warning. Preliminary ProcedureRaise and support the vehicle. Refer toLifting and Jacking the Vehicle.Remove the exhaust manifold. Refer toExhaust Manifold Replacement.Remove the oxygen sensor after the catalytic converter. 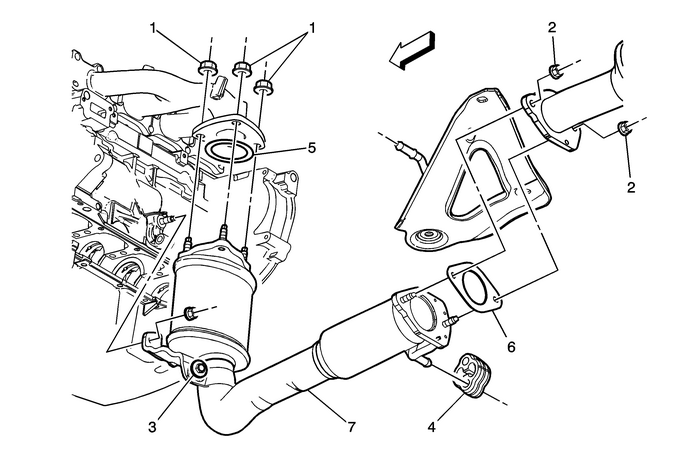 Refer toHeated Oxygen Sensor Replacement - Sensor 2.Remove the catalytic converter brace. Refer toCatalytic Converter Brace Replacement.Remove the steering gear heat shield. Refer toSteering Gear Heat Shield Replacement. Note:Replace with NEW gasket and seal.